For Hair Salon Owners, Beauty Salon Owners, Salon Managers and Those in Charge of Salon Marketing. Brand New 5 Part Salon Marketing School Reveals Salon Marketing Secrets Guaranteed To Increase YOUR Salon Turnover by at Least 30% In Just 7 Workings Days or Less! And if you don't see a difference within 7 DAYS of applying my proven and tested program designed only for salon owners by a salon owner, ask for your money back! YOU WILL EXPERIENCE: MORE new clients, MORE salon sales, MORE in the bank profits ... and you don't need anymore experience, just follow the simple, proven steps I share with you. IMPORTANT: This is the only program in the World where a proven salon owner, manager and expert with a 17 year successful track record in running salons and marketing, reveals for you the easiest, fastest, quickest way YOU CAN quadruple YOUR Salon Profits THIS MONTH alone! (One Salon Owner, took action with my training and increased her salon turnover by 53.4% in 4 weeks, see more below)e-learning course – start and learn at the comfort of your own home and time! Lessons are released on a weekly basis so you get enough time to learn, apply and put in practice each week everything what you learn. I'd Stake My Life That This Is Probably The Greatest Salon Marketing Course Ever Created by a Salon Owner for Salon Owners! UNCOVERING THE BIG SALON MISTAKE: And I'll share with you the biggest, most costly mistake EVERY SINGLE salon owner I have ever met makes (and of course how you can easily fix it this week). MASSIVE SALON PROFIT MAKER: There are 3 things all salon owners I work with do in the first week that increases sales. I'll share them with you. I SUPPLY ALL OF THE SALON MARKETING TOOLS: I am going to give you all the salon marketing tools you need to make this happen in your salon (see a huge list below). How to create letters that ram-pack your salon fast. How to use Facebook to fill empty diaries overnight. How to use websites that sell your salon services like crazy! How to use texting for instant appointments. How to make a fortune doing FREE hairdressing... and literally dozens more techniques as you'll see below. Before I share what the school is here's a salon owner I recently helped to transform her life and her business. Read it and make up your own mind! "This is salon owner Caroline Sanderson. I'm a on-going MENTOR student of Alan's. One year ago I took the plunge and entered a mentor-ship with Alan. 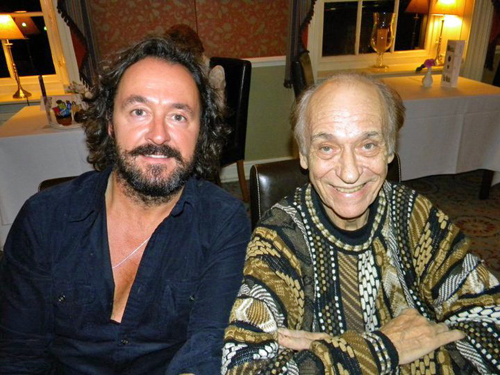 I paid well over £5,000 for Alan's knowledge and skills! I had to fight back the 'I cant afford it demons' and go for it because I knew if I wanted real fast track change with my hair salon I needed to invest and spend time with someone who had been there done it. 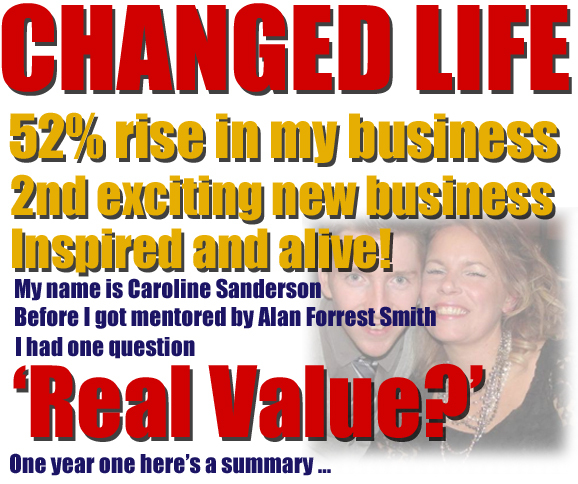 Alan's strategies and advice with guidance and fun along the way took my business to a 52% rise in one year. It would have been more but I had to make HUGE decisions along the way to create the salon of my dreams which meant having the confidence to make changes and get the people out who I knew deep down were not right for me and my business in the long term. I don't know how long it would have taken me to make these changes (if ever) without Alan's support. 'GO FOR IT. Caroline Says: "With Alan's support I made the changes and overall growth of 116% in my salon. I now have the confidence and knowledge to push my career forward and create the work life I wanted. He has genius ideas that were so inspiring I didn't take much time to get excited and start putting them into action. Anyone thinking of working with Alan I would say go for it. There's absolutely no question It will change your life like it did mine." Since working with myself, Caroline's life and salon have been transformed! I taught her what I had already made possible in my own salons and dozens of other sales globally! She even emailed me to excitedly tell me that she had just been and bought herself a brand new Nissan 4 x 4 with her new found profits! It's incredible what changes can be made when an expert with a long term reputation spanning over 25 years guides you in your salon... ARE YOU READY FOR FAST, HUGE CHANGES? MORE CLIENTS FAST: Easy to copy, fast and cost effective ways to pull in more clients faster than any high-lift tint! LESS EMPTY DIARIES: A rock-solid, proven to work trick to make sure you have no gaps in your diary ANY day of the week! STYLISTS PACKED: Want to know how to get your team out of the backroom and on the shop floor. I have developed a way to kill off their time wasting tricks forever! THERAPISTS BOOKED SOLID: Here's an dead simple way to make sure your therapist NEVER have another gap in their book again! MORE SALON CONTROL: I am going to reveal for you the ONLY way to get your salon under control in hours using something most salons NEVER bother with! This is a jaw dropping moment every time I teach it! SIMPLE MARKETING SYSTEMS: the systems I reveal to you are the very same systems I have used for some of my million dollar marketing clients all over the globe. BECOMING THE FIRST CHOICE SALON: so the next time clients think about treatments, haircuts or just a visit to a spa they will choose your out of the dozens of others in your town. And so much more from her training with me. Your Salon Business Can Be BOOMING! Your Life Can Be Very Different! … IF, if, if That's What You Want or NEED from the almost perfect Salon Marketing School! Salon Marketing School: shares salon building business skills and tools so your life can be improved. Salon Marketing School: shares with salon owners how to make enough cash to live the life you really need to live and pack out your salon at the same time! The Salon School of Marketing has been designed to lead salon owners just like you into something much better, bigger and happier. Is that possible? First unlike some so called salon marketing consultants, I have nearly three decades of experience in marketing with nearly 20 of those years in hair and beauty salon marketing. Just go to Google and type in my name, see what you find, I think you'll be impressed. Here's a few results I have helped businesses just like your to create. Increased sales by over half a million in 21 days for a car Co. Salon Expert Greg Milner went from sales of just under $15,000 to sales of over $88,400! Stephen Pierce sold over a million dollars US from a single webpage. Kevin Lewis increased his sales by $2.4million from zero! David Lee went from struggling entrepreneur to sales of over $300,000 in a single weekend. Robert Mc Holl had a 47% response rate from a direct mail campaign (resulted in £800,000 in sales. A Jay Abraham UK campaign pulled in just under £200,000 from a single marketing campaign using a fax mailer. Mark Anastasi went from NO SALES to just under $500,000 from a single sales page. Mike Brescia has a long running webpage that has consistently pulled in 6.4%. BACK TO MY OWN SALONS (I had 3 of them)! I spent 17 years slaving in my own hairdressing salons. I made so many mistakes I'm almost embarrassed to tell you. Some so simple only a mistake would make me aware of them. I went through everything with my hair and beauty salons. Staff misery, no idea how to advertise, being ripped-off by unethical reps, plumbing failures, massive tax demands and day after day of empty salons with staff sat on their backsides in the back room talking about the next night out or party on Saturday night! Let me tell you a story about my own hairdressing salon, it'll help you to fully understand how I went from $112,000 per year to $468,000 with NO marketing experience and how easy it is for your hairdressing salon to do the same. How My First Salon Business Went from Nothing To Number One in Just 18 Months! It was a tiny, tiny salon of 250 Sq feet. I was the only stylist. I had one assistant. The good problem I had was I grew out of the salon very quickly. Within 18 months I had 3 staff, myself and was thinking about much bigger premises. I went from one full time stylist and one part time to, six full time stylists, three or so apprentices, myself and a receptionist. Now lets be honest here, we're hairdressers first and foremost, not bank managers. We can do hair shows and nights out but running a business is nothing like running a salon right? Within months I painfully realized something in my salon that needed a fast track solution. That something was... Marketing of some kind! "I Was Doing All The Hairdressing And My Staff Were Busy Drinking Coffee And Sat In The Backroom Twiddling Their Turbo-Dryers and Tongs?" In other words, all the cash going through the cash drawer was being taken by me, the owner, the fool. Day in day out I was blunting my scissors, stood behind my chair all day long while my staff were doing nothing, zilch ( I know you can understand exactly what I'm saying here). And just for the record at this point. As the salon owner was taking nearly 60% of the salon turnover. You can relate to that as a salon owner right? 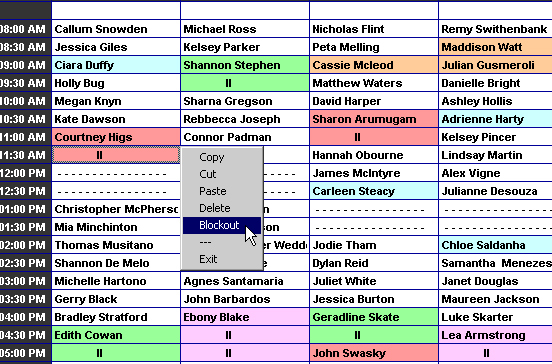 Drastic action was needed: I decided to finish three stylists and try and grow the others. Problem I now had was I was busier on the shop floor than ever and the remaining 3 stylists were doing less than ever. Even worse... I couldn't get a minute to train and educate them. 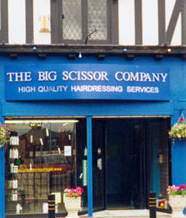 I joined business clubs, spoke to "consultants" went on courses, re-fitted the salon and you name it ... I did it. Did it grow my stylist columns, diary and salon business though? NO. After all that expense, wasted money and bad rip-off advice I nearly went bust. This was the turning point that helped me grow my easy hair salon marketing system and literally explode my salon profits in weeks! A Turning Point That Transformed My Hairdressing Business and Will Transform Your Salon Also! I sat at home and thought about the hairdressing monster I had created. I created a simple solution that had been used in other business's. I started it and after testing stuff and persevering ... it worked. HOW YOU CAN SMASH TARGETS WEEKLY: Can be taken by the hand and be blown-over as you see your hair salon business hit new levels and break old targets week, after week, after week (one salon owner has reported to me during numerous supporting phone calls that she had to buy the shop next door to accommodate new business. Her salon income tripled over a 3-4 month period!). HOW YOU CAN CREATE EASY EFFECTIVE MARKETING: Can kick-start the cheapest yet highest returning marketing program you'll ever see in your life. Stuff what the Reps and glory boys tell you coming through your salon this is the kind of program that WILL show you marketing is a cinch. HOW TO TURN RECEPTION INTO THE CONTROL CENTRE OF ANY SALON: For years I resisted having receptionists. I discovered a very simple way to make sure reception in your salon is the best investment and cheapest investment you'll ever make... GUARANTEED! Discovering how to use hair salon marketing in my salons literally changed my life. Here's a Photograph of the home I built myself from the new profits I created within my salons! 5 Bed roomed detached English barn sitting in an acre of land with it's own orchard! I think you'll agree... stunning! Let me introduce you to another salon owner just like you... Steve. 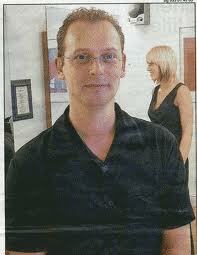 I have been in the hairdressing business for 12 years. I have 2 shops one just hairdressing and one that is hair and beauty. The latter I have had for 3 years and the other for nearly 8 years. The first shop has gone from strength to strength and staff retention has been fantastic however this has caused its own problems with a certain amount of what I call “Comfort Zoning” everyone does well and earns a good wage things are easy and everyone works reasonably hard. As minimum wage has hit Juniors have become very expensive. We have had the luxury of training our juniors during the day which has affected turnover but the training has been much more successful as they take more in during the day and I feel that it would be a step in the wrong direction to go back to evenings. I was paying my stylists 40% of their takings on target figures however I realised these were becoming easier to hit and were two low. As we improved average bill and got things the way they should be everyone was hitting their 40% with ease. So in November we had a price increase of 10% (for the business) and we changed stylists commission to 35%. Fun that was as you can imagine trying to explain that one, anyway I have put in bonuses so in-fact they can still earn 40% but at much more realistic figures. I have never really marketed our salon or done special offers apart from Christmas time more to reward the clients than anything else. Then I stumbled across this web site and found the content really refreshing and interesting and exciting. After reading many of your ebooks I soon realised how I had been missing out!! So the minute I saw your marketing advice I just had to get it. The day I got it I was presenting a Strategy Meeting with my staff for 2004, what a fantastic opportunity to put what I was reading into practice. So I explained some of the things we were going to do and they all seemed very supportive. At the same time I had a really good Senior Stylist from my other shop leave and I used the Job Flyers in the window to help find someone. I have always had a ongoing recruitment plan in place but this was the first time I had really marketed the idea. What a response, not so much from stylists but receptionists and juniors coming out of my ears. One stylist did come in but he wanted to work at my first shop and not the other as he had a big client base he said would follow him. So I thought well I do not really need someone here but I will interview him and give him a trade test. He was Fantastic!!! I just had to take him on!!!! So great new stylist, your marketing programs, lets give it a real shot. You see to him this was how we always operated he did not realise that I had just got all this great information. ... he was fully booked Thursday, Friday and Saturday taking £700 even with the offers. Great! monitored his progress put up the sheets you sent and put all the others staffs details on their two. Now we have always put a graph on the staff room every week but with out the detail its always been who took the most. Every member of staff was interested and could not wait to find out who had rebooked the most clients. The second week went just as well even thought the weather caused a lot of cancellations. But he was still busy full booked Friday and Saturday, he even took the most on Saturday just gone!!! I have noticed that the rest of the team have really started to pull their socks up, have started to be able to fit people in?, retail more? have fun in trying to get clients to rebook?. The third week. Things still going well!! My new stylist took £959.00 net last week and did loads of offers, the flyer re only 50 cut & colours working fantastically well. He has done 10 new clients to the salon and 50% have already re-booked. Starting new stylist at our other shop next week and we will be doing the same with her. So far things have gone extremely well with the Alan's advice I promise to keep you posted. Thanks. PS Steve recently updated me on his progress and tells me one of his team is taking around £1,700 per week and all the salon is booked up every single week. It has taken him 16 weeks to get to this stage. NOT BAD I SAY! I UNDERSTAND WHERE YOU ARE IN YOUR SALON RIGHT NOW ... I've Been There With My 3 Salons, Made All The Mistakes Before You. I Also Found The Solutions! Salon Marketing School(TM) has been created to give you solutions so you can start marketing your salon, make changes in your life and make more money fast! Since then I have also been around the globe almost six times teaching other salon owners just like you how to create more salon success! In 2003 I spoke to over 1000 salon owners in former Soviet state, Latvia. 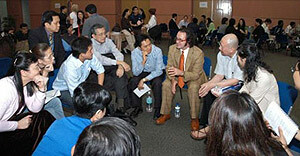 In 2006 I spoke to over 250 salon owners in Sydney, Australia. 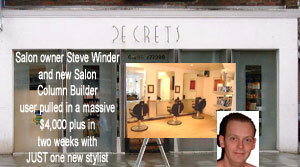 For over 2 years I wrote a salon building column in UK based Salon Business magazine. And I want to say up-front, although I no longer own salons I have been working in marketing and the hair salon business now for well over 20 years. In fact just a while ago I took on as a consulting client the UKs number one salon, the totally brilliant, Michel Van Clarke in London. Experts all over the world have paid for my advice. 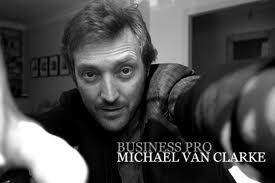 I have spoken to over tens of thousands of business owners just like you all over the planet. Let me share a little more with you to PROVE my expertise. All of the following are fact and can be checked on any of my websites. Since leaving my hair dressing salons I have built a reputation for incredible marketing results for my clients. In fact I have been to ... Australia, New Zealand, Singapore, Hong Kong, Russia, Dubai, California, New York, Atlanta, Las Vegas, Malaysia, to name just a handful of places and taught well over 25,000 people about marketing. These are pictures from me training businesses in Singapore to around 600 people in the room. 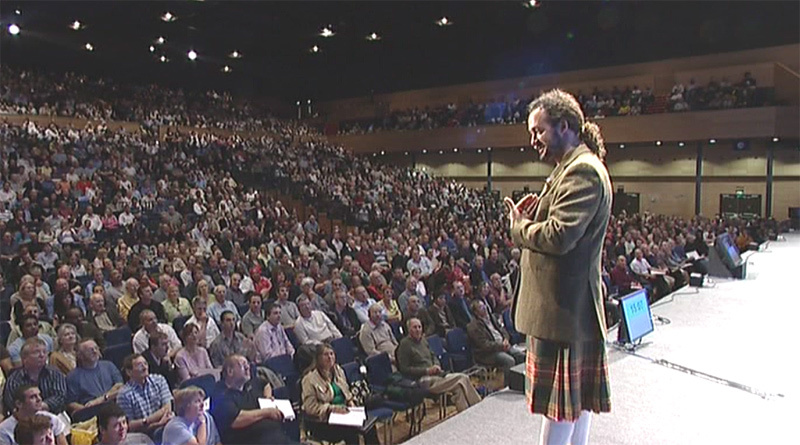 The one below with me wearing my kilt is in England to around 5000 people at one time. That was a breath-taking expereince to say the least. Have you heard of a man named Jay Conrad Levinson? Jay is on THE God father of direct marketing and has published over 50 millions books on the subject. He has been creating huge marketing successes for the past 50 years or more. This is me with Jay at dinner. "Alan … you bring to the marketing landscape one of the most brilliant, sensible and realistic minds on this planet. You live in the present and your advice is so practical and helpful that you wonder why you didn't think of it yourself. But the truth is that few people have the marketing insight that you demonstrate on a regular basis… "
This is a School for Salon Marketing that will literally change the way you think and see your salon and your hair or beauty salon marketing forever! It can change your life, if that's what you want! How To Pack Out Every Appointment In Your Salon - Fast! How To Fill Your Diaries To Bursting With Clients IN Hours – Fast! How To Bring In Tons Of New Clients – Fast! How To Create Salon Marketing That Really Works – Fast! How To Sell More Color – Fast! And Literally Hundreds of Ideas You Can Use Just Seconds After Downloading, Reading and Applying! Over five easy to follow salon marketing sessions I will show you, reveal for you and share with you probably some of the most powerful salon marketing techniques you'll ever hear. Everything you hear in the five modules are salon used, tested and proven to work in any salon. I myself have been in the industry for over 30 years, I had 3 salons over a 17 year period and today I am an acclaimed marketing expert with a lot to share. I loved putting this together, I hope you not only enjoy what you find in the modules but it really does give you what you need in your salon right now. Join The Salon Marketing School course and discover the skills to build, grow and manage your hair beauty business. The download is instant after you purchase. Salon case studies from hair beauty salon owners and experts presented via recorded webcast with a Q&A opportunity. Weekly (or do as fast as you like) assignments with personalized feedback from salon business consultants to help you tailor the course for your salon business, and answer specifics about your salon. Done for you salon marketing tools, templates and the blueprints that can be used in your salon. Replay as many times as you like in the comfort of your own time and place. Everything you need to know right now about packing out your salon is in this course... I think you'll love it! Free Marketing: How to generate 4 times your school investment in 7 Days or less! Assignment: Create a vision that gives you more of a real-life outside the salon. Work on creating salon perception and establish yourself among competitors. Sit, think and plan your salon marketing and salon business properly. Create mental commitment to succeed in salon business. Craft your salon identity that creates salon loyalty. FREE Marketing and Guerrilla Marketing Pt1. The first 3 things you must say when any client walks in the door. Assignment: Create what we call the 3 BIG GUNS LIST … to get your salon kick-started right away! Master-plan the growth of you salon income in the next 6 months or less. Create marketing tools and fundamentals to attract new clients, deepen loyalty from the existing clients. Assignment: Work on growing clients continues. Create your salon blueprint to locate new clients, set up salon marketing tools, create successful and high in demand new services that increases your income; Create pricing structure. What words sell more salon retail or services? How to write 7 words that are guaranteed to increase salon sales. Assignment: Salon marketing blueprints and salon promotions templates. Create your salon marketing promotional materials, salon advertising and salon tools. How To Get To Number One Salon Choice and Remain Number One for Years To Come! Assignment: Create salon reception profits, create successful staff management, understand and create salon numbers, create more salon marketing tools. IS THE SALON MARKETING SCHOOL FOR YOU? Do you want more clients and want them fast? Do you want low-risk, low-investment marketing for your salon? Do you want the appointment book packed to the roof with paying clients? Do you want to find missing clients and pull them back into your salon? Would you like to know how to create advertising for FREE and almost free? Would you like to understand the easy way to use Facebook for your salon business? Would you like to know how to contact every client in your database in 60 seconds or less? Would you like to create more creative advertising and salon marketing? 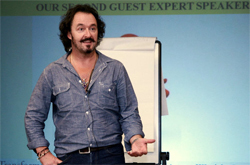 WHAT ELSE WILL YOU EXACTLY TAKEAWAY FROM THE SALON MARKETING SCHOOL? How to create what we call the 3 BIG GUNS LIST … to get your salon kick-started right away! What to tell clients and why for more sales! Pay in full in one payment. No monthly payments required.